That's a wondreful dress - it would look good on a several other royals too, so pitty they are limited on just one style. These shoes doesn't match very good with a dress. Fabulous!! This is the kind of dress, that says I am the queen and it shows. Love the length, the sleeves, and that it fits her like a glove. I can see that many people won't like the hairdo, but personally I find it oh! so chic, and daring. I would have preferred that he sandals would have been less elaborate, but I don't hate them. I like the dress but i think a belt would have added some structure to it. Awful hair!!!! The dress is nice, but not so nice!! Letizia must have a very imaginative hair stylist. Love the qwerky look ! The dress all be it, is stylish, seems to be missing something, maybe a delicate belt, as worn by the model. I really don't like this - I applaud her for playing with fashion but this is definitely not my cup of tea. I think it looks cheap and I don't like the hemline. The hair is well executed but I don't like the effect. She looks like she's at some sort of Star Trek cocktail party. I like that she has developed her own style (and thank God we have moved away from boxy blazers), and that she is willing to takes risks. I put the hair in that category. Overall a nice look. Shoes look good. Hardly anyone can wear a sweater dress, so why not go with it if you can. Love the color. A belt might have been nice, I agree. Ce sont ses filles qui l'ont coiffée . I absolutely love the hairdo. It proves that an imaginative hairdresser always makes the difference between nice and stunning. The dress is gorgeous and fits her like a glove.10/10. Couldn't agree more.The boubble ponytail is a very sophisticated, trendy hairdo. Very difficult to make,to achive a perfect profile. 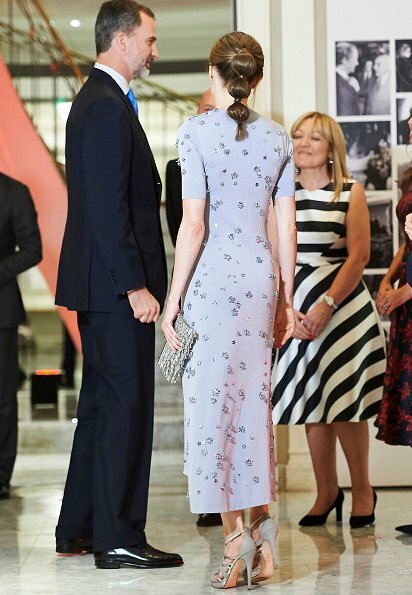 Really not liking Letizia's style of late, in particular this childish hairstyle - what was she thinking? I love it from tip to toe!! And btw: why should all women above 40 have short hair? I really like her long hairstyle and finally she or her hairdresser shows other royals how to be imaginative with long hair. De acuerdo, es joven todavia. Siempre hay tiempo para cabello corto. Ghastly in every sense of the word! Her hair looks like she let her daughters play dress up with it before she went out! And the color just washes her out. She looks fantastic. Really different hairstyle. Not sure if I love it but she looks beautiful all in all. 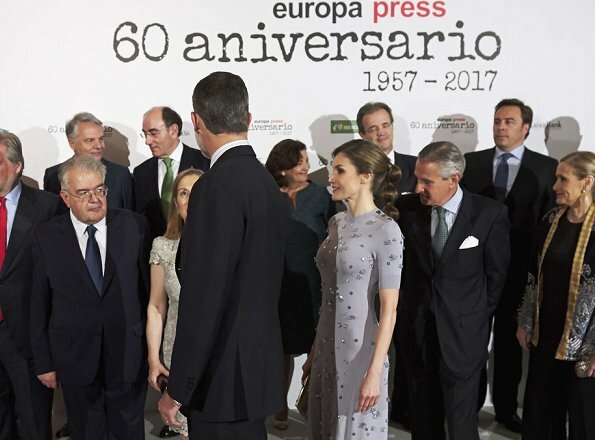 ¡Gracias, Letizia! Por innovar, por atreverse con algo diferente, por ser original y única. I appreciate the fact that she tries different styles, hair, shoes etc. But the whole look this time is not her best. Gustara más o menos. Pero siempre pulida. Se toma su trabajo para estar siempre correcta. This look is a sky full of stars! I think fashion can convey values and as I see it, Queen Letizia and King Felipe represent the constant search of the excellence.